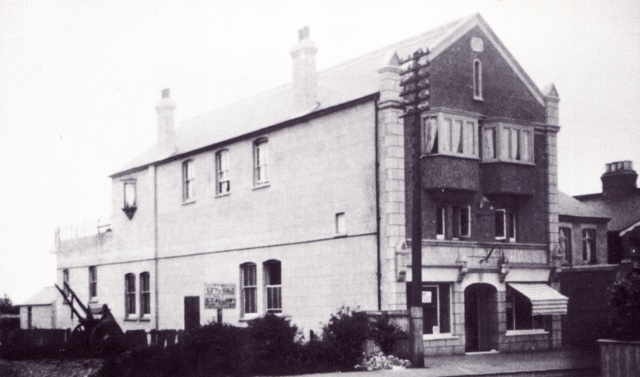 The Public Hall was erected in 1912 by Mr. F. Malthouse in The Broadway (now London Road). It was Hadleigh’s first general social meeting place and over the years was used for a variety of purposes, including dancing, roller skating and as a cinema. For a time, at the front of the hall, there were two shops. The one on the left-hand-side was used by Owen’s greengrocers before they moved across the road, nearer to Castle Road. The right-hand-side shop was used by Schneider’s. The Public Hall is now used by Essex Carpets as a carpet warehouse. It was until recently also their showroom but a new showroom has been established further along London Road. Have just found a slip of paper relating to Dorlie, 72 Castle Rd [the Hawks’ home} stating that the bungalow was purchased by F Malthouse 1910, will have to dig further.